Hug Texts | Messages of encouragement and positivity! Hug Texts – Messages of encouragement and positivity! HugTexts are daily text messages that are full of encouragement and positivity to make your day a little brighter! Subscribe and receive a different text each day to infuse your day with a good feeling – just like a hug! It feels great! 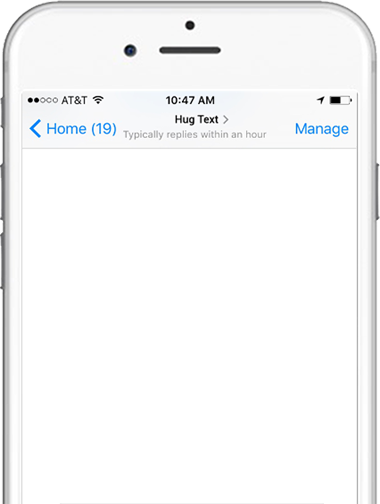 You can also gift HugTexts to a friend, family member, or anyone you know who could use a hug each day! Sign up with your phone number, and add as many friends or family as you would like. You'll receive text messages to encourage and inspire you. Everyone will receive a different and unique text each day! Refer friends and earn a $5 referral bonus! You'll never be able to count the number of people you've touched in this lifetime. You matter! Everything is a part of the journey forward. Whether the road is bumpy or smooth today, find something to enjoy about the ride. Being alive makes you deserving of goodness. You're alive? You qualify! Everything that happens in your life makes you wiser and more capable of a more profound depth of love. Whatever we're grateful for increases our sense of joy about life. Today, someone is grateful for you. You already have what it takes to make today a great day! Look for smiles today. When you see one, smile back! If you don't see one, smile at someone who needs it. Today is a new day you've never seen before. Bring it your best! You are powerful! How will you use that power today? Every day has a "best part." Even if it's this HugText! Add HugTexts to your day and experience the benefits!